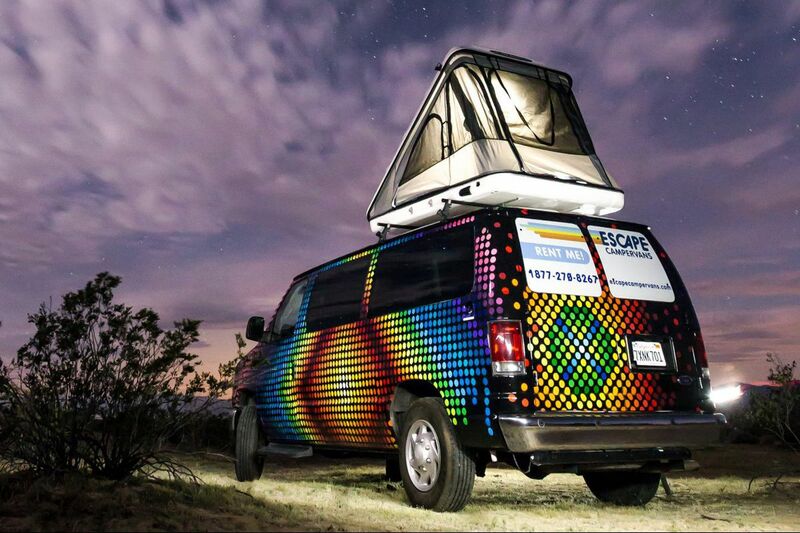 With the addition of an optional rooftop tent, four people can sleep comfortably in the artist-painted Escape Campervans. Years before #vanlife took on a life of its own across social media in the United States, Bill Staggs was onto something. He had fond memories, dating to his late-1950s childhood, of family trips in a Volkswagen van. In the early 2000s, he started thinking that others might like to dip their toes into that nomadic lifestyle, chugging along behind the wheel of a rented classic vehicle with a cult following. "You look at these cars and you think, 'What's the big deal about them? Because they're kind of ugly, really.' That right there is the first clue. They are so plain, they don't have a whole lot of what you call style, but because of that, they burrow a place in people's hearts because of their homeliness," says Staggs, who lives in Costa Mesa, Calif. In 2005, he and his wife, Diane, launched Vintage Surfari Wagons to rent out two vintage Westfalia buses, both equipped with two beds and kitchen equipment. It took time for the buzz to build. "I think, our fifth year, we actually made a little bit of money. We were looking at our tax returns and thinking, 'That's great!' " Staggs says and laughs. "I wonder how much longer this can possibly go on?" Soon after he had that thought, the trend of "van life"– the notion of trading in your home for a life untethered and four-wheeled (and largely without a bathroom) — rose in the United States. Millions of posts on Instagram, Pinterest and Twitter show whimsical, adventurous, and envy-inducing photos of the young and radiant, often with their adorable dogs, traveling across beaches, over mountains and into the desert with the help of a veritable tiny house on wheels. "Van living has become this major craze for people," Staggs says. His company is riding that wave. By summer, Vintage Surfari Wagons' rental fleet will number 25 VW vans, including Bay Window buses, Vanagons and Eurovans. They can seat up to five people and sleep up to four in two berths; rental rates range from $140 to $295 per day, depending on the model and season. The business is one of many of van-rental companies – which are overwhelmingly based in Western states — offering a rambling slice of van life (or simply a convenient camping experience in which most of the gear is included). "Millennials and the newer generation, they would rather splurge money on the experience than [on] staying in expensive hotels," says Hiron Menon, general manager of the U.S. office of JUCY, which rents bright green and purple Dodge Caravans and Chrysler Town and Country vans in Las Vegas, Los Angeles, and San Francisco. Menon describes the average van-goer as someone who prefers spontaneity to planning. "They want to pull over wherever they want; they want to take pictures or selfies; they want to sleep or cook anywhere," he says. The company, which got its start in 2001 in New Zealand, where van enthusiasm has been brewing for years, rents custom-designed vehicles decked out with just about everything a traveler could need on the road: a sink, kitchen and cookware, refrigerator, gas stove, bedding and more. Menon says that the vehicles are popular because they're easy to manage and less intimidating than an RV, and they're especially sought after for camping at multiday outdoor festivals. JUCY vans can sleep two inside, and a tent on the roof can sleep two more. Daily rates range from $45 to $120. Escape Campervans, which opened in 2009 in Los Angeles, has more than 500 rentals available there and at seven other U.S. locations (Las Vegas, San Francisco, Seattle, Phoenix, Denver, New York City, and Miami) with plans to open in Atlanta and Vancouver, B.C., this year. The artist-painted vans — Ford E-150s and Dodge Caravans — can sleep four comfortably (and five snugly) with the addition an optional rooftop tent, and come with a queen-size bed, bedding, and kitchen and camping basics. Rates range from $57 to $130 per day, depending on the season and trip length. Katie Hubbard, director of marketing at Escape Campervans, says that the primary age group of renters is 24 to 35, and the U.S. market is still getting acquainted with the van-rental option. About 60 percent of Escape Campervans' customers are international. Their goal is generally the same: Get off the beaten path and explore the open road on their own schedule without juggling all the gear. "We like to make it easy so that everyone gets to focus on the fun parts, like where to go and what to do," Hubbard says. "Everything else is kind of taken care of." Matt Wolski and Jen Lopez launched Basecamper Vans in Salt Lake City to give people a taste of van life while exploring the great outdoors. "The reality is, full-time [van life] is kind of a pain. But having a little nibble for a week or two every year is really fun," Wolski says. The company has two types of vans that sleep two to five people (with the addition of a rooftop tent), and rates range from $109 to $139 per day. The larger version resembles a cozy apartment, with a built-in kitchen that includes a refrigerator, propane stove, heater, LED lighting and bedding. "We basically built the vans that our parents wanted to travel in," Lopez says. Wolski and Lopez can also act as trip planners, offering suggestions on routes, hikes, and side trips. One popular journey that customers take is "the Mighty Five," a 900-mile Utah trip that includes Arches National Park, Canyonlands National Park, Capitol Reef National Park, Zion National Park, and Bryce Canyon National Park. Basecamper Vans, like all the companies in this report, charges an additional fee after drivers exceed a certain number of miles; 125 miles a day are included, and can be averaged out across the trip, but after that it's 35 cents per mile. That, in part, is because of the wear and tear on the vehicle. But it also fits the van-life philosophy, which is to relish and revel in the scenery, rather than blast by it. "The best part of campervan travel is that it's not big enough to hang out inside [one] all day," Wolski says. "You have to get out and wander around the brilliant and wild lands around you."